On March 20, 2019, the Sun entered Aries, which marks the Vernal Equinox. It is a day when the length of day and night is equal everywhere on Earth. The Full Moon in Libra occurred a few hours later, on March 21, when the Moon opposed the Sun. A new astrological year begins when the Sun enters Aries. Astrologers may use the equinox chart in determining the themes of the next twelve months. The first degree of Aries is called the Aries Point. It is a sensitive point, where the individual’s life and world events intersect. The Sun is now in conjunction with centaur Chiron and one of the largest trans-Neptunian objects, 120347 Salacia. In Greek mythology Chiron was the wisest and justest of all the centaurs. He was not a troublemaker like the rest of them. His lineage was different from other centaurs. Chiron was the son of the Titan Cronus and Philyra, one of the Oceanid nymphs, which were the personification of springs. Chiron had the upper body of a human and the lower body of a horse. His mother was so disgusted by how he looked that she abandoned him at birth. Chiron was fostered by the Sun god Apollo, who was a god of medicine and healing, music, poetry, and more. Apollo was especially concerned with the health of children. Additionally, he was the protector of fugitives and refugees. Chiron learned numerous skills from Apollo and became a great healer. He was a teacher and a mentor for many of the greatest heroes in Greek mythology. In astrology Chiron is usually referred as the wounded healer. However, I prefer Eric Francis’s description of Chiron as raising awareness. Because of the looks of the mythical centaur and the way his mother treated him as baby, Chiron could also be seen as representing ignored and disdained people, among other things. 120347 Salacia is named after the Roman goddess of salt water and the consort of Neptune. The god Neptune wanted to marry the beautiful nymph Salacia, but to preserve her virginity she fled as far as she could and hid from him in the Atlantic Ocean. Neptune sent a dolphin to look for her and persuade her to come back. She finally agreed, and so she became the goddess of the sea. Salacia was a goddess who was a bit overlooked in mythology. She was diminished to represent an aspect of Neptune, the violent and gushing waters. Her Greek equivalent was Amphitrite, the wife of Poseidon. Only in one occasion she appears as a real goddess, namely at the birth of the Sun god Apollo. March 22 is the World Water Day, an annual UN observance day that highlights the importance of freshwater. It is celebrated around the world with various events, which offer an opportunity to learn about water related issues and take action to make a difference. Water is a human right. No matter where on Earth we live, the one thing we all share is the ocean. Water covers about 70 percent of the Earth’s surface. The ocean plays a fundamental role in the world’s water supply, and it is our mutual interest to take care of it. Marginalized groups — women, children, refugees, indigenous peoples, disabled people — are often overlooked, and may face discrimination, as they try to access safe water. In 2019 the theme for the World Water Day is “Leaving no one behind”. My interpretation today for the Sun at the Aries Point in conjunction with Chiron and Salacia is, that the aspect is raising our awareness about the condition of the ocean and encouraging us to take action in order to secure freshwater for everyone. 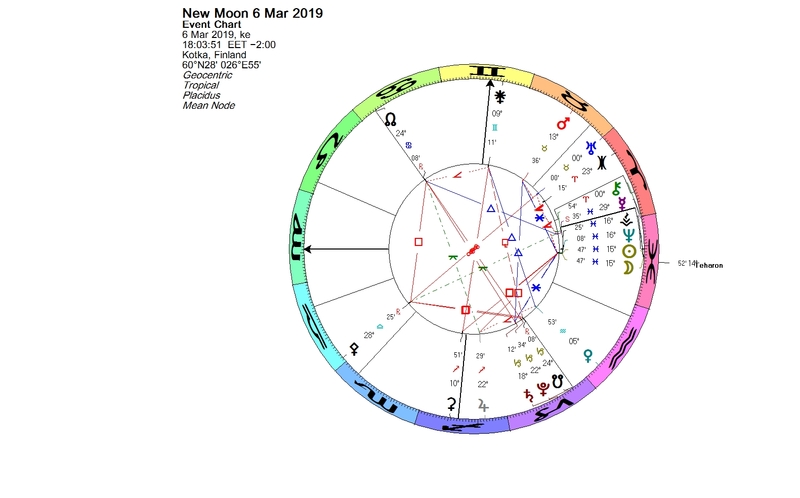 Mercury turned retrograde in the last degree of Pisces on March 05, 2019. 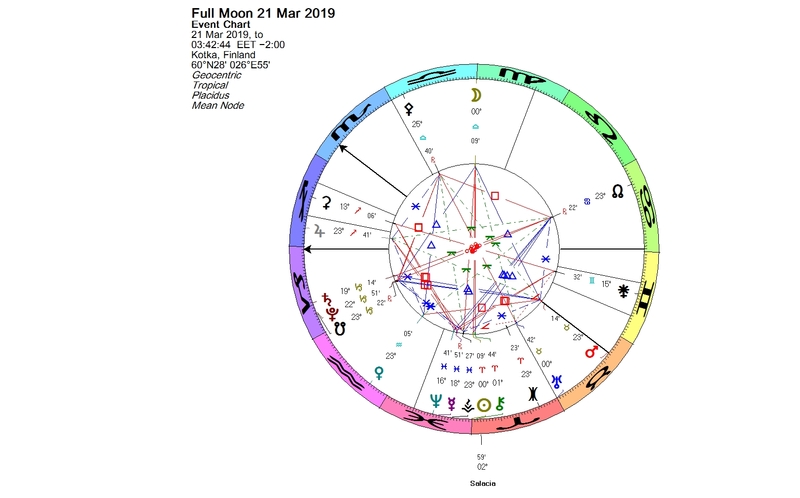 The next day, on March 06, 2019, Uranus changes signs from Aries to Taurus, and later on the same day the New Moon takes place in mid-Pisces in conjunction with Neptune, the ruler of Pisces. Two minor planets, a main belt asteroid Vesta and a trans-Neptunian object 88611 Teharonhiawako, are in conjunction with the New Moon, too. 88611 Teharonhiawako was discovered in 2001 and its orbital period around the Sun is 290 years. It is actually a binary object. The companion is quite large and named Sawiskera. The names come from the Iroquois creation myth. Teharonhiawako was the creator god of the Iroquois and Sawiskera was his evil twin, eventually conquered by his brother. Teharonhiawako planted the first maize plant. He also created the first people: the first from the bark of a tree, the second from the sea foam, the third from the black soil and the fourth from the red earth. The main diet of the Iroquois came from farming. Maize was considered as a special gift from the creator god. The Sabian Symbol for the New Moon is Pisces 16, “The flow of inspiration”. This can be a time for special gifts. You are currently browsing the Lunations by Kirsti Melto weblog archives for March, 2019.